If you’ve done your homework, you’ve probably come across countless “Customer Avatar” worksheets from sources all over the web. There’s no doubt that this is a very – if not the most – popular way to determine your go-to clients. Some even fill out multiple avatars to understand the needs of different types of clients or customers. But, in my experience, it’s been a fruitless exercise. I’ve tried it probably 10-15 times, but never end up using these avatars in my real-life marketing and business practices. Instead, I came up with my own method… But before we get into that, let me tell you a bit about my initial journey to finding my people! When I first started freelancing, I wasn’t exactly in a position to be choosy. (Beggars can’t be choosers, right?) My very first client as a full-time freelancer booked me for a small gig – just $200 for some basic design work. I also dabbled in social media management, copywriting, and design. Essentially – I was picking up whatever project someone was willing to hire me for, and I was doing it at a very low cost. When you’re first starting out, you need to get some experience, testimonials, and sample work under your belt before you can start charging beaucoup bucks. In your first stages, it’s more about building credibility – so it isn’t a bad idea to take on some lower-paying projects to get your feet wet and build your portfolio. As time progressed and my business grew, I started my own website and increased my prices. I began offering a full day of brand strategy for $700. At this price point, I was attracting entrepreneurs similar to myself (though slightly more established). They were more knowledgeable and invested in their business, but still solopreneurs or small businesses with a limited budget. Still – I noticed a huge difference between the clients I first attracted (at $200) and those who were willing to pay $700 for my expertise. Over time, my business has flourished (which I am forever grateful for), and I’ve been able to increase my prices significantly. I now charge $6,000 for a full Brand Development Contract. These are one-on-one projects that last a minimum of two months. As you can imagine, the type of entrepreneur or business willing to pay $6,000 is very different from those in the $700 range. It’s important to note that I’m NOT saying that those beginning stage clients are bad or cheap. The same way that I was in the first stages of my brand, they were too. What you’ll come to notice as your career progresses is that the more you learn and add to your skillset, you’ll take on bigger (and more lucrative) projects. I couldn’t have possibly charged $6,000 when I started out. I was too new, too green. I lacked the knowledge, skill, and mindset that I’ve since grown into. It wasn’t until I experienced major growth in my own abilities that my business was able to reflect that same value. For premium pricing, you need to know that you can deliver. You should be confident in your offering and its value. For now, my best advice if you are just starting out is – start where you are. What works for you now will (most likely) not work for you later. Rather than daydream about where you’d like to be, pick the low-hanging fruit and work your way up the ladder! As you learn more about yourself and your brand, you’ll automatically come to know what you like or don’t like in a client. Even so, there will be hiccups. Just this week, I had to fire a client AND turn down an $8,000 project. Would I have turned down an $8,000 project in the beginning? HELL NO. But I wouldn’t have crushed it back then either. Now that I’ve grown into my offering, it’s much easier to determine who is or isn’t a fit – and much easier to say no, even when the price is right. 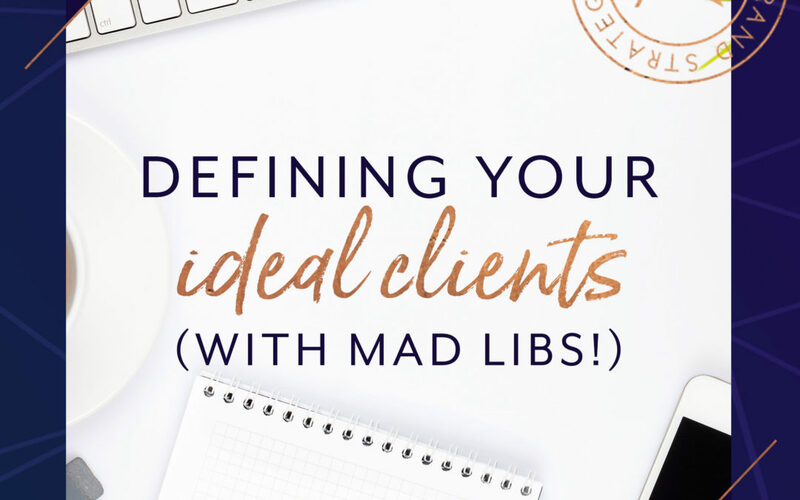 Always remember: Your ideal client is REMARKABLY LIKE YOU. The better you know yourself, the better you will understand the people who come your way. Even at 16, when I started my first business – a small photography business – the clients who came my way were very similar to me. They could have gone to a big studio, but they valued personal services. They considered photography an art form, and didn’t trust their business in the hands of sit-and-click studios and corporate giants. They wanted something more intimate and personal, and that’s what I was able to offer them. Now, the same is true: my clients are SO much like me. Just like I do, they consider branding to be so much more than design. Just like me, they have a deep desire to know who they truly are and to be genuinely understood. Ask yourself, what do you have in common with your best clients? Ask yourself, who needs and values what I can offer the most? This may (and honestly SHOULD) change over time. These are often things like support, accountability, and confidence building… but as your skill set grows and you are able to offer more, you’ll notice that you attract clients on your same level. Your offer should be CLEAR, CONCISE, and COMPELLING. You’re the expert. It’s up to YOU to educate your clients on how and why they should do something. Your help should motivate and inspire them to reach their goals. It should engage your ideal audience emotionally, and draw them toward a like-minded movement or cause. 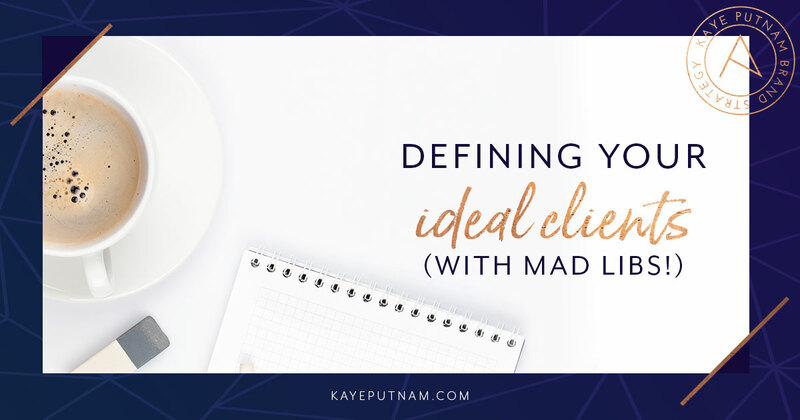 BE MORE YOU – and reassess your ideal client as you learn and grow. Give it a shot! I’ve included my go-to Mad Libs exercise below (along with my answers, which are underlined). My ideal client is someone who believes that brands are more than design. They have a desire to find who they are and to be who they are. This is something I’ve learned by interacting with my ideal clients: they’re good at everything they try, so they have a hard time choosing what they should do. You might call them action-takers, driven, and motivated people. They are NOT perfectionists. They value action over perfection, and they’re ready to grow their business in a big way. 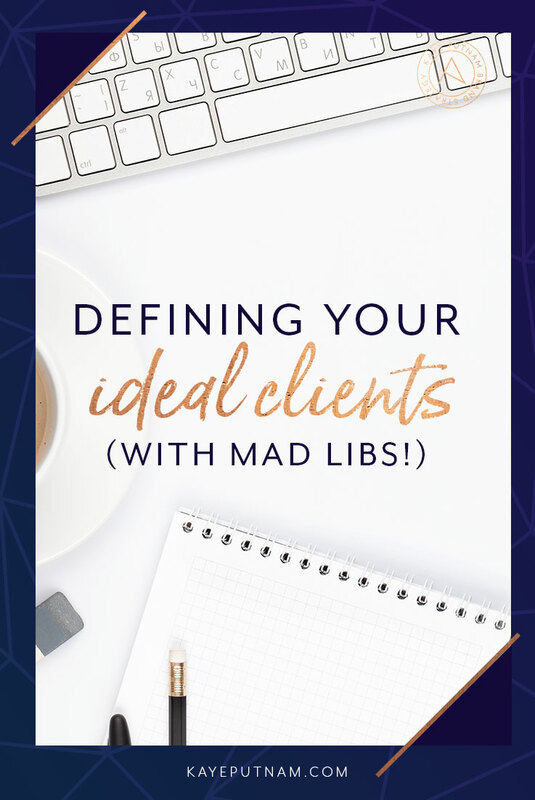 What did this exercise teach you about YOUR ideal clients? Leave a comment below to share your best insights! My ideal client is someone who believes THAT IT IS OKAY TO GO BACK TO THE BASICS EVERY SO OFTEN. They have a DESIRE TO STEP AWAY FROM ELECTRONICS TO WRITE THEIR NOTES; TO DO LISTS, REFLECT THEIR THOUGHTS, PLAN etc. This is something I’ve learned by interacting with my ideal client: IT’S GOOD TO HAVE NOTEBOOKS FOR ON THE GO; BEING ORGANIZED WITH BULLET JOURNALS, DAILY PLANS, MEMORIES etc. You might call them OLD SCHOOL. They are not against HAVING NOTEBOOKS. They value PUTTING PEN TO PAPER AND PLANNING. THANK you Kaye. Love this paragraph for identifying your ideal client. It is very thought provoking. Here is my first draft but I have already tweaked it a few time. I will be giving this more thought. My ideal client is someone who believes that finding emotional happiness is worth fighting for. They have a desire to find a solution on how to obtain emotional freedom from autoimmune disease. This is something I’ve learned by interacting with my ideal clients: they’re good at understanding they need to improve their emotional well being, but they have a hard time figuring out how to start when there isn’t much information available on this topic and they don’t have the energy or clear thinking to work through it alone. You might call them action-takers, driven, and motivated people before they became ill. Now they need clarity, step by step action plans and support. They are NOT perfectionists. They value results over perfection, and they’re ready to implement changes in their life. >> My ideal client is someone who believes that they can make a global impact. They have a desire to bring their vision to life. This is something I’ve learned by interacting with my ideal clients: they are not afraid of the WHAT of their mission, it is the HOW that holds them back. You might call them visionaries. They are NOT playing small. They value leaving the world better than they found it. My Ideal client is someone who believes health and fitness is more that just losing weight. They have a desire to find who they are and what their purpose is. This is something Ive learned from my ideal clients, they have a strong mindset, so they just need a little accountability and like mindedness to be more successful. You might call then go getters, driven, and self motivated people. They are not Quitters. They value their health, and are willing to try anything that is just out right healthy for them.